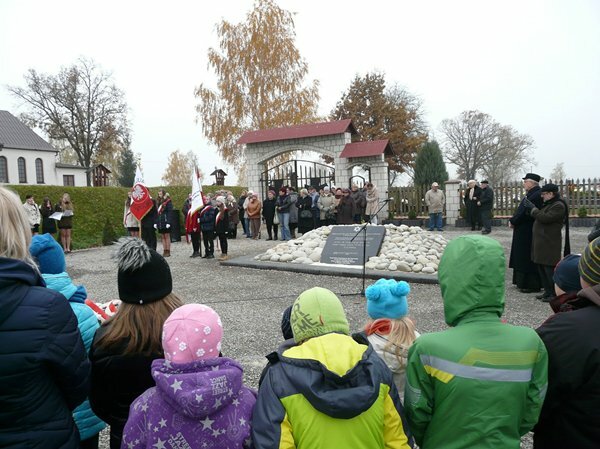 Fundacja Pamięć, Która Trwa - Cichobórz – November 5, 2015. Cichobórz – November 5, 2015. 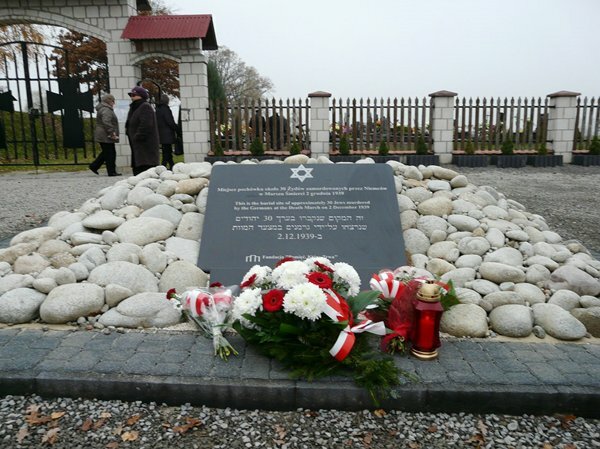 The ceremony of unveiling a memorial plaque set up by the Lasting Memory Foundation took place in Cichobórz, next to the grave of approximately 30 Jews murdered by the Germans at the Death March in December 1939. 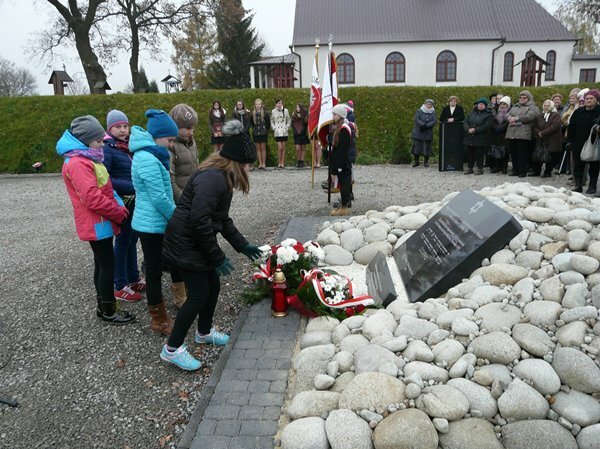 Students of five local schools, invited guests and Cichobórz residents paid tribute to the dead. The Foundation covered the grave with stones and, along with the residents of Cichobórz, arranged the surrounding area. The ceremony was attended by: the Chief Rabbi of Poland Michael Schudrich, Bishop Mieczysław Cisło – member of the Polish Episcopal Conference, Mayor of Hrubieszów – Jan Mołodecki, Priest of Cichobórz Parish – Daniel Pachla, students and teachers of local schools, the Farmers’ Wives Club and residents of Cichobórz. 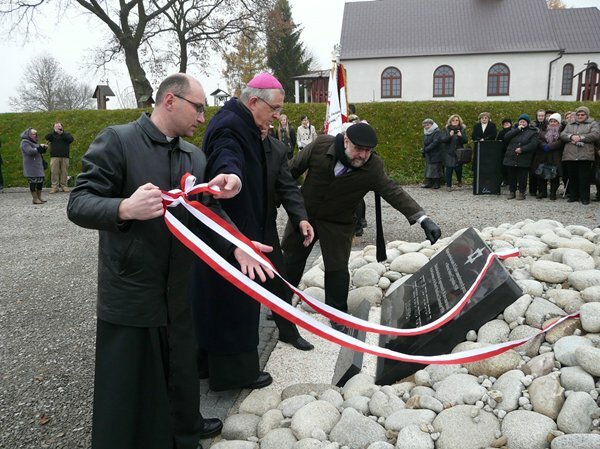 Parish Priest Daniel Pachla thanked everyone for becoming involved in the actions for honoring the memory of the people buried in the grave.” He added: “May this place remind us where the hatred, lack of tolerance or empathy lead”. 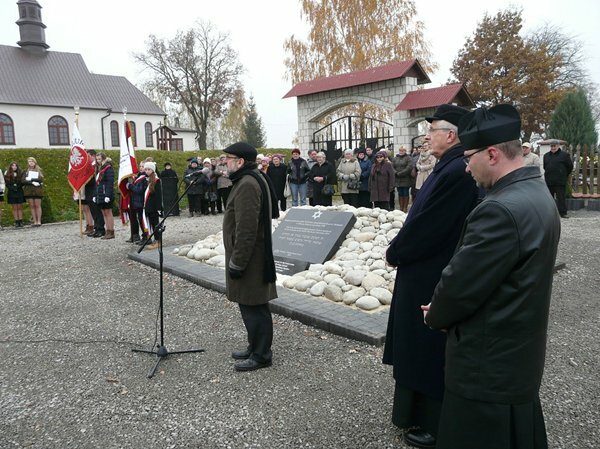 The ceremony was conducted by Zbigniew Niziński, President of the Lasting Memory Foundation, who recounted the story of the tragic events of December 1939. The Germans forced about 1800 Jews to march from Chełm towards Hrubieszów. They were men aged from 16 to 60. Along the way, the Germans were constantly shooting to the rows of Jews, killing everyone too weak to continue marching. Several hundred people had died before the group reached Hrubieszów. There the Germans added another several hundred Jews to the marching column who went on through Kozodawy and Cichobórz into the soviet zone. The road was muddy, those who lagged behind were killed. The bodies of the dead were scattered on the road. At the Germans’ command, the residents of Cichobórz buried approximately 30 people by the roadside. The whole Death March route, as long as 100 kilometers, claimed the lives of more than 1000 Jews. At the end of the ceremony, Bishop Cisło said: “A sign of hope for the future is the presence of students from local schools as well as the artistic program they presented. It reveals a remarkable spiritual culture of the local school communities, the youth and their teachers. We should create the culture of expression, so that people do not get hurt by others. A person can be murdered by words. Congratulation on the culture that you have manifested here”. The commemoration was conducted with the support of Harley Lippman, member of the US Commission for the Preservation of America’s Heritage Abroad, who lost many of his family members during the Second World War.